In case you don’t already know, WetLeather is an email list for fans of motorcycles based mainly in the Pacific Northwest. Most members are from Oregon, Washington, Idaho and British Columbia, with a handful from California and others scattered over other states. When you join the list you see every other member’s postings, and everyone sees each of your posts. I joined in late 1996. It was then and still is a fun group of folks. The Fish Fry was an annual springtime event, one of at least four times each year when list members would get together in person. Fryer Martin and Andewife hosted the event at their home in Vancouver, Washington. It had a Cajun theme; they provided boiled crayfish, breaded and fried fish: catfish, salmon, halibut, etc., and hushpuppies Fryer Martin told folks that if they wanted anything healthy they had to bring it themselves so folks brought salads and vegetable side dishes, and desserts. There was always excellent homemade ale on tap. The Pope had gotten married. No, not that Pope, I’m writing about the WetLeather member whose list nickname was The Pope. A few weeks before the April 1997 Fish Fry a special email message arrived from Saint Carl; it was sent to every member of the list except The Pope and it described a plot. The special message-to-everyone-except-The-Pope explained that Saint Carl, the Wizard, and several other WetLeather members had been asking The Pope what he and his bride would like as wedding presents, but they couldn’t get a straight answer. The email message suggested that people bring that very traditional wedding present, a toaster, to the Fish Fry. The presentation of wedding gifts would be added to the usual festivities. Saint Carl’s message continued, “Don’t spend too much; go to Goodwill or Salvation Army and pick up a toaster for a couple of bucks.” Decorating the toaster was recommended. 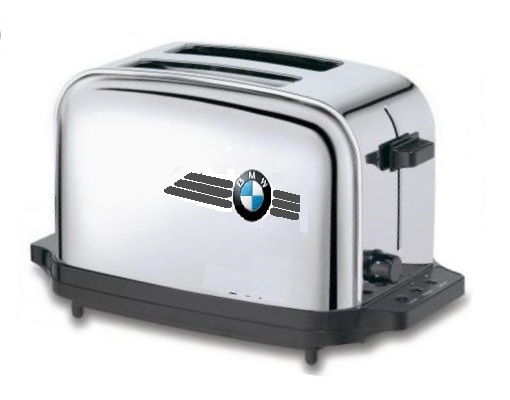 I contacted Saint Carl off-list and found that The Pope liked classic BMW motorcycles, so I went to the nearby BMW dealer and bought a small BMW roundel and with a few strips of black tape made my cheap chrome toaster look like the one in this photo. Let me explain. 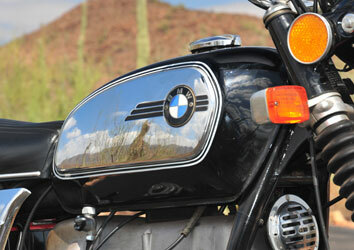 In 1970 BMW introduced new models, the “slash 5” bikes. One of the options on the /5 models was a fuel tank with chrome side panels. Chrome and BMW? BMW’s had always been somber black with subtle white pin stripe decoration except for a few that were cream with black pin stripes. The new flashiness caused comments and the tanks with the chrome side panels became known as “toaster tanks.” Below is a photo of a black one. I gift wrapped the toaster, bungeed it to my HawkGT and headed north for the two hour ride to Vancouver. This was my first WetLeather “In Real Life” activity, and I was able to start putting faces to some of the names I had been seeing on the list. There was good food, good drinks and fine conversations, and a wide variety of motorcycles to ogle. After the excellent dinner everyone gathered into the living room for the opening of wedding gifts. The crowd was on one side of the room and The Pope and his new wife on the other side with a pile of presents. Most of the presents were suspiciously the same approximate size. The first gift was…a toaster! And the second, and the third, and so on. There were a few plain toasters but many of them were decorated. One was painted teal, known to be The Pope’s favorite color. One had been converted to 12 volts and fitted with a plug that matched the accessory plug on the Pope’s motorcycle. When my toaster was unwrapped the Pope looked at it for a moment, then he started chuckling. “Who brought this?” he asked. I put my hand up. “Clever. Very clever,” he said. I was pleased that he got the reference. After about six or seven toasters were unwrapped, to much laughter, the Pope had become wary of packages that were toaster-sized, but almost all of the gifts were that size. His new bride, who wasn’t a motorcyclist and was meeting most of the group for the first time, was trying to get into the spirit of the event but her smile looked nervous to me. The Pope found one gift that couldn’t possibly be a toaster. It was rectangular, about 16 by 12 inches but only one inch thick, wrapped in plain brown paper. He picked it up and asked “Who brought this one?” BoyChaos admitted it was his and before opening it the Pope gushed, “Thank you, thank you!” He turned it over and back, and shook it a few times to see if it rattled. Nope. He unwrapped it and it was…a toaster! It was a wire frame camp toaster, designed to hold two slices of bread to toast over an open fire. It was a good trick and everyone had a hearty laugh over it, especially The Pope. The final gift was a really big box from the host and hostess. The Pope eyed it with suspicion but the Fryer assured him it was not filled with toasters. The Pope opened it and found dozens of loaves of bread. He grabbed a loaf and threw it into the crowd, then another, and another…. after about minute of this and a dozen or so loaves tossed, without any signal that I could detect, the crowd threw the loaves back in unison, burying the Pope in loaves of soft white Wonder bread. Everyone was laughing about this, including The Pope. I laughed so hard my sides were aching. My description doesn’t do it justice; you really had to be there. Soon after it was time to head home and I looked for the host and hostess to thank them for the fine evening. To my surprise our hostess, Andewife, gave me a big hug! One best be very careful about requesting nicknames. There are really only three ways to get nicked. 1. Do something so incredibly stupid that it must be celebrated forever more. 2. Do something neat so well that is must be celebrated forever more. 3. Do something no one else wants to do that must be celebrated forever more. It wasn’t long after this post that Bill, leaving a WetLeather party held at a home in a semi-rural area, stumbled and fell into the small creek that ran along the edge of the property. He wasn’t hurt and later made this post to the list, responding to De Judge’s criteria. > 1. Do something so incredibly stupid that it must be celebrated for ever more. Like trip and fall in a creek? > 2. Do something neat so well that is must be celebrated forever more. > 3. Be willing to do something no one else wants to do. That was good on all fronts, and Bill’s WetLeather nickname was Trip from that day forward. Thankfully the “Light Fantastic” part was dropped. Some months later, after I had become more active on the list, with a nickname of my own, I not only saw someone earn her nickname, I was largely responsible for it. But that’s a story for later.